When we first landed in Galpagos we saw a sea lion sitting at a table and that table was at a restaurant and the sea lion was sitting on a chair. After we went on the boat our guide took us for a walk along the beach. We saw a big marine iguana and a sally light-foot crab. The beach was really nice and a big wave knocked me over! The water was nice and warm and I had fun playing on the beach and in the waves with my Daddy. School Notes - The Galapagos Islands are located 1000 kilometres (600 miles) west of the coast of mainland Ecuador. The flight from Quito takes about two hours. 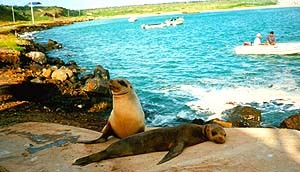 The main airport in Galapagos is on Baltra or South Seymour Island. The flights from Quito and Guayaquil arrive here every morning at 11:30.